There had long been cross-over between jazz and blues, from the jazzy accompaniment on the earliest blues records to the use of twelve-bar blues arrangements in jazz. Versatile musicians like guitarist Lonnie Johnson refused to be categorized and recorded both jazzy blues and bluesy jazz, as well as some genre-defying stuff in-between. And talented singers like Billie Holiday staked out similar turf for vocalists. The coming boogie woogie craze would further blur the lines, creating a sound that combined the speed and artistry of jazz with the raw urgency of the blues. Innovative swing bands like Count Basie’s would take that blueprint and lay the groundwork for “jump blues,” which would eventually evolve into rock and roll. Listen to the following recordings, and you can hear the framework already in place. 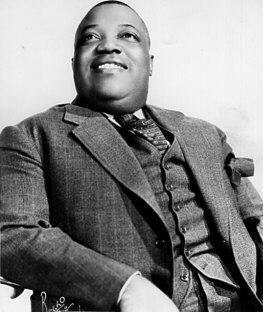 Meade “Lux” Lewis may be the most famous boogie-woogie pianist in history, but he was almost completely overlooked. He first recorded “Honky Tonk Train Blues” in 1927, but it was not released until 1929 (Paramount 12896 ), and even then it was not well received and Lewis faded back into obscurity. The record did make one notable fan, however: legendary record producer John Hammond, who actively searched for Lewis and eventually found him washing cars in Chicago. Hammond got Lewis back in the studio to re-record the song for the European market in 1935 (Parlophone R-2187 ). This time, he continued to perform although work was hard to come by. 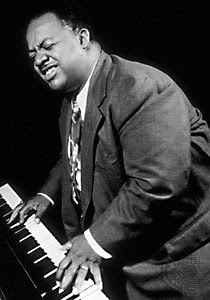 He eventually got his big break in 1938 – and started a national boogie woogie craze – in a series of concerts arranged by Hammond and featuring fellow pianists Albert Ammons and Pete Johnson. The year before, Lewis again recorded his masterpiece in the studio, and this recording captured him at his peak, making it easy to see why concert goers would be impressed. He is masterful on the keys, making the complex song sound effortless. The steady, eight-to-the-bar beat really does invoke a train rolling down the tracks, although for modern audiences, it brings to mind even more the outrageous energy of the early rock and roll it would inspire. While Lewis’ left hand keeps the rhythm, his right hand rattles off a series of entertaining themes. Some of these are breathtaking in their speed, but some are just as impressive in their use of space as Lewis switches from brashly pounding the keys to dancing across them fluidly and then back again. When top Kansas City bandleader Bennie Moten died of complications after a tonsillectomy in 1935, many alumni from his group followed pianist Count Basie in forming a new band. They were joined by a new tenor saxophone player, Lester Young, who would soon become a legend. With a stellar line-up of the best Kansas City had to offer, all the pieces were in place for greatness. And it would not be long in coming. Their first recording session, and the first ever for Lester Young, was produced for Vocalion by John Hammond in October 1936. The band had already been signed to the competing Decca record label, so they recorded under the name “Smith-Jones, Incorporated” (named for trumpeter Carl Smith and drummer Jonathan “Jo” Jones). One of the tracks was “Lady, Be Good,” and it would prove a stunning debut. It starts with just Basie on piano, Walter Page on bass and Jo Jones on drums. Page’s subtle, eight-to-the-bar rhythm is perfectly steady while being utterly fluid and alive, and Basie’s minimalistic approach to soloing is riveting. Then Young enters on tenor sax and redefines the instrument’s role in jazz. Whereas the top tenor player of the day, Coleman Hawkins, had established the saxophone as a lead instrument with his straight-ahead, virtuoso playing, Young takes a more relaxed but no less swinging approach, creating a smooth sound that floats gracefully and speaks directly to the soul. Carl Smith takes a turn soloing with muted trumpet, and then the band wraps things up with an amazing finale that transitions from an amazing duet between Basie and Page to an even more amazing one where Smith plays staccato bursts beside Young’s transcendent saxophone. By the time Basie’s band made its first recordings for Decca in January 1937, it had grown from a small group to a full orchestra. One of their first singles was “Boogie Woogie (I May Be Wrong),” a song inspired by the music of boogie woogie blues pioneer Pine Top Smith. While the song’s structure is based on boogie woogie, it takes liberties with the format in translating it to a big band setting. Basie interjects a few passages of straight boogie woogie piano, but through most of the song he plays in his typical, spare style, creating open spaces where a few well-placed notes can speak volumes. Likewise, the rhythm section keeps an eight-to-the-bar rhythm through much of the song, but adopts a more relaxed pace during the vocals. Those vocals, by Jimmy Rushing, are the real showcase of the song and are wickedly amusing: “She got ways like a devil, she shaped like a frog / Start to lovin’ me, I holler ‘Ooo God-dog!’” Rushing, known as “Mr. Five by Five” (five feet tall and five feet wide), had the perfect style for Basie’s kind of jazz: boisterous and bluesy at its core, but polished and nuanced enough on the surface for jazz. Basie and company had their first nation-wide hit with “One O’Clock Jump .” Like many of the band’s numbers, the song was a “head” arrangement where the musicians improvised around a repeated, brief melody (or “riff”) without sheet music and with only a very basic idea of the song’s structure. With talented musicians such as these, the result was often magic, and in this case they created a timeless masterpiece that would be one of Basie’s signature tunes for the rest of his career. It begins with a teaser of a piano solo from Basie, then the riff begins and the musicians begin one of the most memorable string of solos in jazz history. Particularly noteworthy are the tenor saxophone solos by Herschel Evans and Lester Young. Evans goes early and displays a resonant, sophisticated tone that conveys as much emotion as a human voice. After a slurred solo by trombonist George “Rabbit” Hunt, Young enters with a high, airy solo that goes from insistent repetition to playful inventiveness. Trumpeter Buck Clayton and bassist Walter Page take their own brilliant turns, then Basie comes back for another spare interlude that heightens the tension. The payoff comes as the full band plays together to end the song.